Still recovering... I will be happy when this is all over. I went back to work this week which was easier than I thought. Everything just takes twice as long. AND it got COLD again. I am glad today is the last day of February. I spent quite a bit of time doing my proposals for the next issue of Cast On. The selection meeting is next week. Several lessons arrived this week and several students signed up for the Basics Course...not a bad thing to do in the winter. Just a reminder...when you send in lessons, be sure you have the correct postage. Sometimes when you use Click-and-Ship you can select the wrong category. If postage is due and I am not home they leave a notice and I have to drive to a specific post office which is in a very busy shopping center (no parking and since I am using a cane this is a big deal to me) and there is a very long line. Round trip, I am looking at about an hour which puts me in a bad humor. Sorry for whining but this unnecessary trip makes it hard for me to review the lessons the day I get them. Finally, something that applies to the Masters Program...In Level 1, you have to knit a mitten which has a stripe. 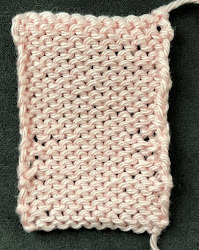 This tests the knitter's ability to use the technique of a jogless join and to weave in the yarn tails appropriately. The photograph shows the jogs which occur when the end of the round meets the beginning of the round. This is a problem for any colorwork project in the round but it is particularly noticeable in stripes. Generally when you are working stripes, you want a specific number of rows in each color and when you slipped the first stitch of the round in the new color, this reduced the number of stitches in that column. If you do want the same number of stitches in the stripes this means that when you change colors, you will need to move the beginning of the round over one stitch to the left so that each column of stitches have the same number of rows. The procedure for each new stripe is the same. Work the first round in the new color and when you get to the first stitch, slip it. Each stripe will move the beginning of the round one stitch to the left. This photograph shows the jogless joins. Here is the video: Jogless Joins. Meg Swanson also has a jogless join technique where you insert your needle into the stitch below in the first stitch in the new color but I have found the slipped stitch method easier. Whichever technique you use, the important thing is to clean up the joins when you weave in the yarntails. This is where most mistakes are made. I'll show how to do this in the next tip. Saturday is a Met HD broadcast...Prince Igor by Borodin. I know absolutely nothing about this opera except that the running time is 4 hours and 30 minutes. It will be interesting if nothing else. So that means that Salon will be on Sunday from 1:30 to 4:00. I have to drive to the airport. I was working on my cardigan I started months ago when I remembered that Cynthia's birthday is next week. I started a pair of socks in pink when I remembered that I made her pink socks last year so I switched to the ragg wool. She lives in Texas and the yarn is a wool cotton blend which is more practical than wool. I have a half finished sock for me I put aside as well. This is very unlike me. I rarely have multiple projects going. I want to finish them all up by the end of next week as it will be time to start on the Cast On garments. My surgery went OK and I am walking with a cane and driving but it will be another 4 weeks until I am done. I certainly am capable of doing my blog. I was able to go to the photo shoot on February 4th. It was a bit of a thrash dodging snow and ice storms but it went quite well. Here is a photo of the skirt and jacket (thanks Sadie for the photo). This is not the photo that will be in the magazine. The pattern for the skirt is in the current issue. The jacket will be in the summer issue. I did get a few lessons to review. I didn't look at anything the first two weeks after surgery as it took just about that long for the anaesthesia to work its way out of my system. I was quite loopy. Since I didn't take any pain medicine it had to be the anaesthesia. Those that completed lessons during that time are listed to the right. If I missed anyone, please let me know. Continuing on with stripes, the tip this week is about spiral or helix stripes. I first discovered this in Montse Stanley's Knitter's Handbook quite a few years ago. I thought it was just about the neatest trick I had seen. If you knit in the round, you know that you work in a spiral. By that I mean you don't complete a row and then jump to the top of the next row as you do in flat knitting. This is why there is a jog when the end of the round joins the beginning of the round. For spiral stripes you use this to your advantage. This is one of those things you really have to try to see how it works. It is very easy. A few caveats...This is more difficult to work on double points as you have several strands of working yarn and it is very easy to start in the wrong spot. I prefer doing this technique on circulars. The other problem is that when you pick up a new color you have to be VERY careful not to pull it too tightly or the tension is just terrible. There is no limit, other than your patience, on the number of colors you can use. As with any colorwork, yarn management is a pain. If you look at the bottom of this photograph, notice that the red stitches just start in the middle of nowhere. You can see how the stripes spiral. This photograph shows why you might want to use this technique. There are a total of 8 yarn tails to weave in. With stripes, you would expect a lot more. Again, I love stripes. This technique is a great way to use up stash yarn for hats, mittens and socks. Salon will be on Sunday this week from 1:30 to 3:20. I will be going back to work. We shall see how that goes! The night before surgery I started on this chevron shawl with Zauberball yarn. Chevron shawls are my go to project for mindless knitting. I knew I wouldn't be able to do anything too complicated. It isn't blocked yet and I haven't woven in the ends yet. I also knit a pair of socks for Stephanie's birthday which I neglected to photograph. Maybe she will take a photo for me. The next selection meeting is March 4th and I am putting together my proposals. The stitch anatomy lesson is slip stitches. The Fashion Framework is designing Arans. I plan to do a hat and mitten set with slipped stitch cuffs. I'm going to size the argyle vest I did for men for children's sizes (special request) and I'm going to do a tunic. Details to follow later. Like I said, I've had lots of students sign up...Laura from CO, Sally, Ellen, Elizabeth and Kitty from MA, Melinda from GA, Beth from CA, Sigrid from Italy, Jason from MI, Danielle from WA, Bonnie from HI, Kimberlee and Heather from VT, Margaret from Australia, Pilar and Kasey from NJ, Marsha from MN, Jennifer from PA, Angela from OK, Joyce from AZ, Barbara from NV, Katherine from Al and Lillian from CT have signed up for the Basics course. Robin from TX, Michelle from FL, Traci from WA, Kerstin from Germany, Melinda from GA, and Paola from the UK have completed Lesson 1 of the Basics class. Eva from CO and Rhonda from PA have completed Lesson 2. Annet from The Netherlands has completed Lessons 1 and 2 of the Basics class. Donna from MI, Farida from CA and Kathleen from CO has completed Lesson 3. David from FL has completed all three lessons. Congratulations! Jean from OH has completed Lesson 1 of the Finishing class. Ivy from NY, Dorothy from WA and Karen from VT have completed Lesson 2.